Schloss Alterlaa is one of many, many Baroque palaces in Vienna - one in the style of a garden palais. For details on this species of palace, please read my article on the "Palais of Vienna". The Schloss Alterlaa has a rather big garden, remains of the old parks that were once part of the palace. The oldest record of Schloss Alterlaa can be found in documents that date back to 1244 - back then, today′s palace was a castle and seat of a local landlord. The current building dates back to around 1700. It is a palace with four wings that accommodate the "Brenner-Felsach′sche Gutsverwaltung", an administrative organisation that looks after private property of a formally noble family that owns the palace. The original palace from around 1700 was a rather simple building; in 1766, the Prince Georg Adam of Starhemberg purchased the property. He hired one of the best-known architects of Vienna of his time, Nikolaus Pacassi - who was also involved with the design of the Imperial Palace in Schönbrunn. Schönbrunn, by the way, is in walking distance to Schloss Alterlaa - if you want to make it a "little known Baroque palace trip", walk from the parks of Palais Cumberland through the parks of Schönbrunn and to Schloss Hetzendorf; from here, it is a few more minutes to Schloss Alterlaa. 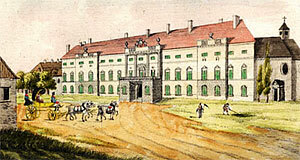 Until 1770, Nikolaus Pacassi extended and modernised Schloss Alterlaa until it had gained its current shape. The road that approaches the palace is a protected chestnut tree alley that is now a street called "Gregorygasse". It is locally well-known for its old trees and dates back to 1783, although several trees had to be replaced by young ones since then. In the same year, the English-style landscape garden was completed. After the end of both WWI and the Austrian-Hungarian Empire, Schloss Alterlaa was sold to Sir Hans von Brenner (he of the "Brenner-Felsach′sche Gutsverwaltung", see above). Sir von Brenner was somebody with a rather questionable taste - at least when it comes to entrance gates: He ordered the construction of an enormous and rather pompous gate to supplement the high walls he had built around the palace. In addition, he had the antechapel of the palace′s chapel demolished. Neither palace nor park of Schloss Alterlaa are open to the general public. It is worth checking out if you happen to be or live in the area, but no tourist attraction in the strict sense of the word. Attractions nearby are rather sparse; most of the 23rd district comprises of residential and commercial areas. The same thing applies to the southern parts of the neighbouring districts Hietzing and Meidling. The Wienerberg area and the Wasserturm Favoriten are not too far and maybe on your back to a more central part of Vienna.